SSGS programs develop tomorrow’s leaders through innovation and personal development. Social Sciences Grant Support (SSGS) aids in the preparation of proposals, offering assistance on policies and procedures, budget preparation, and other relevant aspects of extramural support proposals. Once a project is funded, SSGS staff provide principal investigators with a monthly statement of expenditures, projection of expenses as needed, and advice regarding dispersal of funds. Depending on the principal investigators’ requests and needs, SSGS handles all or any part of the accounting and administrative tasks associated with a given project. These services include, but are not limited to, the hiring of project personnel, processing of payroll and invoices, request for travel advances, and the purchase of equipment and supplies. We are located at 2134 Rolfe Hall. 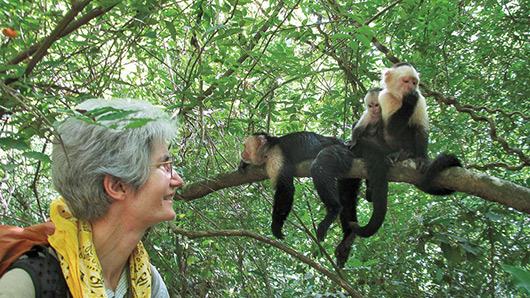 Braving floods, fires and swarms of vampire mosquitoes, UCLA Professor Susan Perry has spent 25 years chasing capuchin monkeys through the jungles of Costa Rica. Her data have transformed what we know about these fascinating primates — and include enough stories of power, envy, lust and greed to keep a telenovela on air for many seasons. Enhancing collaborative scholarship among experts distributed across campuses will position the UC as the premier institution for black studies in the United States. The Consortium for Black Studies in California, led by Robin Kelley at UCLA, will focus on humanistic and arts-based studies, such as film, music, poetry and fiction, that are relevant to California and often overlooked in other black studies programs. A repository for standardized architectural information & drawings.